"This is an easy and tasty take on slow cooker pork chops. 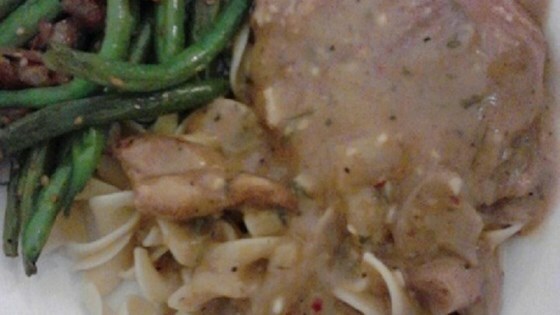 I serve these chops and the sauce over egg noodles or linguine." Stir together the flour, rosemary, mustard, salt, garlic powder, and pepper in a bowl. Dredge the pork chops in the seasoned flour, shake off excess, and set aside. Heat the vegetable oil in a large skillet over medium-high heat. Add the pork chops and cook until golden brown on both sides, about 4 minutes per side. Place the onion, mushrooms, and garlic into a slow cooker. Add the seared pork chops, then pour in the cream of mushroom soup and Marsala wine. Cover, and cook on Low until the chops are tender, 6 to 8 hours. A Puerto-Rican style tender and flavorful pork roast. The nutrition data for this recipe includes information for the full amount of the breading ingredients. The actual amount consumed will vary. Very tender and tasty! And sooo easy to make! Served it with garlic buttered noodles and had none leftover! Will definitely be made again many times I am sure!!! Thanks! This was very good. I only made a small change and that I didn't use Marsala wine because I didn't have any. I used a very nice Italian wine I had open. The flavor was terrific.